If you recently tried to upgrade to windows 10 from windows 7 or 8, chances are that you may have bumped into one or a couple errors one of which is the activation error code 0xc004c003. 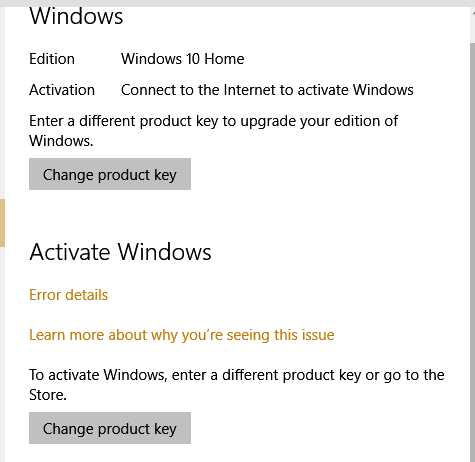 Most people encounter this error while trying to activate Windows 10 Home via a product key which the software rejects. You would then see the following text. This product key doesn’t work. You might need to get in touch with the store or company you bought Windows from, or you can buy a new key from Microsoft. Here is a screenshot of some part of the error screen. Here are a couple ways to take care of the error 0xc004c003. If you are moving from an older version of windows, then you should upgrade to Windows 10 rather than doing a clean install. For a second chance, do a clean install of an older version (7 or 8), then do an upgrade to version 10. Follow the steps below. 1. Insert your Win 7 or 8 boot CD, then restart your computer. 2. At the boot screen, change your boot settings via BIOS to boot through the installation CD. 3. Since you installed Windows 10 on your own, I would believe you already know how to go about this installation. Complete the installation. Next step. 4. Now install all available windows updates so you can see the Windows 10 upgrade notification in the system tray on the task bar. If you still cannot see the notification, then install the Windows Media Creation Tool. 5. After installing the tool, click on “Upgrade This PC” to download and install Windows 10 on your computer. The install and activation will be straight forward and will not cough out any errors. Hopefully. I don’t know how i landed here, may be through google but where is the solution man? Sorry about that, looks like the post disappeared for a while there. It has been reinstated. Thank you.